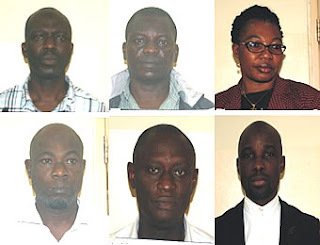 Six staff of the Central Bank of Nigeria (CBN) implicated in an eight billion Naira defaced and mutilated currency recycling scam, have been remanded in prison custody on Tuesday. This detention is subsequent to their arraignment by the Economic and Financial Crimes Commission (EFCC), before Justice Nathaniel Ayo-Emmanuel of a Federal High Court sitting in Ibadan, the Oyo State capital. The suspects: Patience Okoro Eye, Afolabi Olufemi Johnson, Ilori Adekunle Sunday, Kolawole Babalola, Olaniran Muniru Adeola and Fatai Adedokun Yusuf, were arraigned on a five-count charge bordering on conspiracy, fraud and stealing. Specifically, the CBN employees were alleged to have compromised the CBN’s Briquetting exercise, meant to mop up mutilated and defaced higher denomination currencies from circulation, to combat inflation. Instead of destroying the currencies, they allegedly recycled the notes and substituted them with newspapers neatly cut to Naira sizes. When the charges were read to them, they pleaded not guilty. After their plea, prosecuting counsel, Rotimi Jacobs, asked the court for a trial date and for the defendants to be remanded in prison custody. He opposed their bail applications, urging the counsel to the defendants to present their bail applications formally to court. However, counsel to the first accused person, K.A. Lawal, made an oral application for bail. All other counsel followed suit. Justice Ayo- Emmanuel adjourned the matter to June 9, for hearing of the bail applications and July 6 and 7, for commencement of trial. He ordered that all the defendants be remanded in Agodi Prison custody, located in Ibadan.